With the partnership of Microprint, a leading swiss based manufacturer of pad printing equipment, we are proud to provide the highest standard in term of printing solution. See below the detailed range of product available. Bespoke solution required ? Please feel free to enquire our sales team. The Smart line is an inexpensive pad printing machine for manual use. 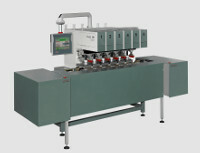 It is a manageable machine for large and small series in advertising printing. 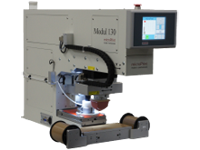 The LCN line includes ideal pad printing machines to integrate into entire pad printing installations. Due to its compact construction they can be used in very tight spaces. With the help of a machine base they can also be used manually as stand-alones. The MS line is a conventional machine Serie with all the modern features, such as automatic viscosity control and cliché temperature regulation. With pneumatic drive. 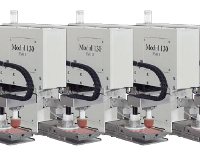 The MSS line are pad printing machines with swivel heads needed for vertical prints. Pad printing machines with programmable print positioning. Linear or servomotor driven. You can access and print different pictures with this machine. Primary used in flexible production areas. All parameters, including the correction of the print positioning, can be accessed via the touch screen. Several machines can be controlled with one touch screen. This allows the tool free setup of one machine or even an entire facility with several modules through a single touch screen. All parameters can be saved and re-accessed. 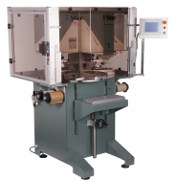 The 5star line are multi-color pad printing machines, for which only one print retainer is needed. Due to extensive programming options and units, you can complete even very complex printing tasks. If you cannot find a suitable machine among our standard pad printers, we can develop and manufacture customer-tailored printing machines. The Portal Machine comes with a parts retainer which is positioned under the different working stations. It operates using a linear motor. 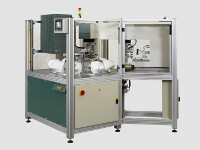 You can integrate pre-treatment, drying, laser labelling and many other systems into the unit. As an option, the parts retrainer can also be rotated enabling the most complex printing applications. XY positioning allows several images to be positioned under one cup. The working sequence can be programmed freely. Programming is intuitively and displayed graphically. Network machines are used by customers who want to build their own system and need several pad printing machines. A network machine comprises a display, a power box and several pad printers. The display can be used to set up all printers. Due to the fact that the control is centralized, a pad printing job can be saved and accessed at a later time. Due to their simple mechanics, rotary tables are very robust and reliable solutions for prints with 1 to 4 printing stations. Pre- and post-treatment, rotating, loading and unloading stations can be added - the choice is completely yours. All printing stations can be used in any of our standard pad printers. The transfer carre technology allows the use of 4 to 10 print stations in the smallest of spaces. This solution is suited if you have many print designs and high volume. Of course, pre- and post-treatment, rotating, loading and unloading stations can be integrated as well. All of our ML and MS units and many other modules can be used as print stations. The transfer linear line is a system using plates. The plates are transported from one printing station to the next. At the end of the machine process, a lift moves the plates one level down from where they are transported back. At the beginning of the machining process, another lift moves the plates upwards. One advantage of this system is the easy access to the machines modules. Moreover, the numer of holders can be varied. One single holder is enough for trial runs and small orders. Additional plates can be added, depending on the desired speed. Pre- and post-treatment, rotating, loading and unloading stations can be installed as well.